It's been a year and a half since OCZ went bankrupt and Toshiba acquired its assets. In this time we have seen OCZ transition all of its products to Toshiba NAND and we have also discussed how Toshiba has helped OCZ with its quality/validation processes, but quite frankly we haven't seen anything truly concrete coming out of the partnership. The Trion 100 is here to change that as it's the first Toshiba built drive that will retail under OCZ's brand. The Trion 100 is a significant signal of the companies' strategy moving forward. While Toshiba is letting OCZ run its business independently, the two work closely together on new products and roadmaps to maximize resources and avoid overlaps. For TLC the companies decided to utilize Toshiba's IP because it had been developing a TLC SSD for years and was simply much longer in the process compared to OCZ. The Barefoot 3 doesn't have proper TLC support, so OCZ would have needed to either design a new controller or use a third party one, which isn’t as economical as using an in-house design. OCZ wasn't involved in the development of the Trion 100, but it did help Toshiba to validate the drive. Basically, Toshiba approached OCZ in Design Verification Test (see our fab tour article for details) phase when it already had working samples and OCZ provided Toshiba with general feedback and suggestions for bug fixes through its own internal testing. 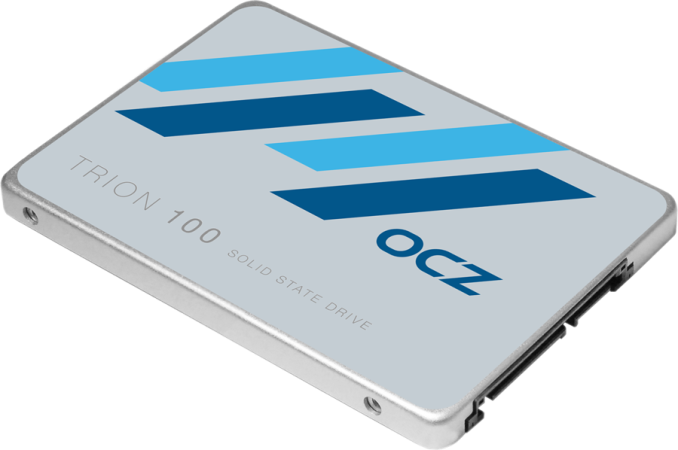 None of OCZ's firmware engineers were involved in the Trion 100 project, though, as the design and development were executed solely by Toshiba. Manufacturing and run-in testing is also handled by Toshiba, so in all honesty the Trion 100 is a Toshiba drive that retails under OCZ as Toshiba doesn’t directly engage in the retail market. Since Toshiba only does OEM sales, it isn't used to discussing its technology in detail, especially with media and the public. In the OEM market it's fine to sell a "black box" and only disclose the necessary specs (like performance and endurance) in a data sheet because ultimately the OEM customers are buying a solution with the underlying technology being a secondary interest (I would argue that most PC OEMs don't even fully understand the technology). As a result, the technical details of the drive are very scarce. The TC58 controller is supposedly made by Toshiba and so is the firmware, but Toshiba isn't willing to disclose any specifics of the architecture. However, I discovered that the PCB layout closely resembles the Phison S10, and the relation is substantial enough that I doubt it's a coincidence. There are only minor differences in resistor and capacitor placements, but when focusing on the area under the controller the two are undoubtedly a match. The timing is another clue because at Computex Phison told me that the company is a week or two away from finalizing the TLC firmware for the S10 and now a few weeks later Toshiba puts out its first TLC drive with nearly identical look to Phison S10 drives. Officially Toshiba and OCZ are saying it’s a Toshiba controller, although OCZ is aware of the resemblance, but obviously the company can’t differ from Toshiba’s word. I did let OCZ know about my concerns regarding another rebrand (the Indilinx Everest controller turned out to be a Marvell silicon after all) and what it may do to the recovering OCZ brand, but OCZ’s hands are tied because the Trion 100 is fundamentally a Toshiba drive. 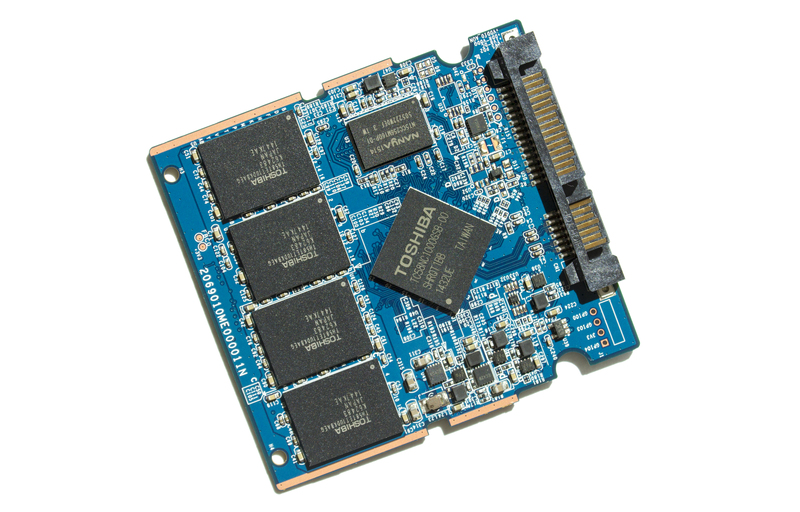 OCZ has always been quite open about its technologies (Barefoot 3 for example), but as Toshiba has been doing business in a certain way for many years it will take time for the two to adapt. In the end, the Trion 100 has significant educational value to the Toshiba-OCZ organization because this is the first time that a Toshiba drive is specifically marketed for the retail market. 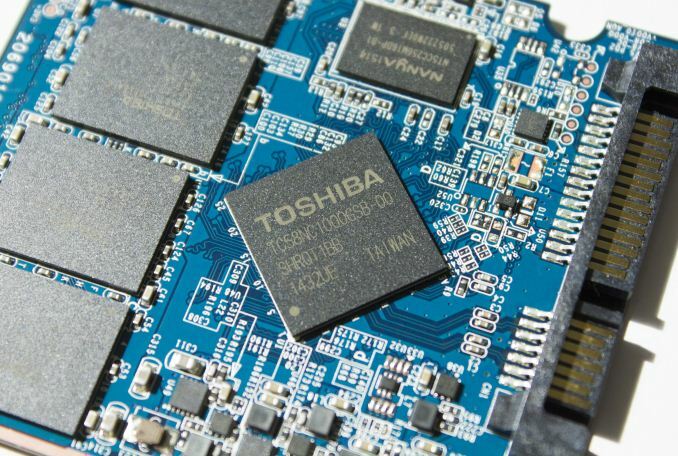 Toshiba and Phison have a very close relationship, so a co-developed controller is hardly a surprise, especially since Toshiba has done it before with Marvell and JMicron. Toshiba is one of the few companies that have (limited) access to Phison's firmware source codes and all Phison drives are manufactured in Toshiba's factories (Phison doesn't sell drives under its own brand, but it provides fully assembled drives to companies such as Corsair and Mushkin). To me the biggest question is how customized the firmware is and how much it differs from the stock S10 firmware that Phison will be shipping to its own OEMs. I think it's safe to say that the silicon itself is the same because a separate die would be costly, but I suspect Toshiba has had a significant impact on the firmware. I don’t have any Phison S10 with TLC at hand at the moment, so we’ll have to wait a little longer before we can investigate how big of a difference Toshiba’s firmware makes. The TC58 doesn’t support LDPC error correction (and neither does the S10 for that matter), but utilizes Toshiba’s QSBC (Quadruple Swing-By Codes) ECC. Since Toshiba is tight lipped about any of its in-house technologies, the details surrounding QSBC are scarce, but I would speculate that it's something in-between BCH and LDPC error corrections. While LDPC offers higher error correction capability, it’s also slower as soft decoding is a time consuming process, so QSBC should provide better performance while still providing enough error correction capability to enable the use of TLC NAND. The Trion 100 uses pseudo-SLC cache to for improving write performance. The NAND is a specific SKU with pseudo-SLC capability (instead of simply writing to the lower pages), but unlike what SanDisk is doing in the Ultra II, Toshiba’s NAND doesn’t have a fixed SLC portion with different transistor characteristics. The size of the SLC cache is fixed, though, and it’s 1.5% of the total NAND capacity. That’s similar to what we have seen in other TLC drives and since client workloads are bursty by nature there isn’t really a need for more than a few gigabytes of SLC. There are some write optimizations done to reduce write amplification when writing from SLC to TLC, but again even OCZ isn’t aware of the specifics. Despite the use of TLC NAND, the Trion 100 boasts excellent endurance. A part of that has to do with different validation workload because Toshiba uses JEDEC’s client workload to specify endurance, whereas OCZ provides worst-case figures based on a 4KB random write workload with substantially higher write amplification. This stems from the enterprise space where OCZ has been using 4KB random writes ever since the company started reporting endurance and in order to align with the enterprise numbers OCZ has decided to use the same workload for client drives as well, despite the fact that it’s arguably an overkill. OCZ is currently validating the rest of its drives with the JEDEC client spec and in the future we will likely see both figures, which I find to be a good strategy because it also gives us an insight to the write amplification. The Trion uses Toshiba's A19nm 128Gbit TLC NAND, which is manufactured using the same underlying technology as the NAND used in SanDisk's Ultra II since the two companies have a NAND joint-venture. The most interesting aspect is that the 960GB model uses 16-die packages, which we haven't seen from Toshiba in a shipping product yet. Toshiba's NAND is actually packaged by a company called PTI, which is the same company that assembles SSDs for OCZ and a variety of other vendors. To be fair, everyone here would expect a certain degree of performance at each price point... This drive drops the ball on performance, so it needs to pick up the slack when it comes to price. Here is direct advice for OCZ: this is a very bad SSD, and there's no way to position bad SSDs profitably because the bottom of the market is already crowded with bad SSDs that have to be sold below cost. It's not a bad SSDs. Its slow, i give you that, but not so slow, that typical user will notice. Still orders of magnitude faster than typical HDDs. Speaking from my perspective, you can't just create a mediocre product and expect to survive in this day and age, unless it has outstanding value for the money. As for storage solutions, SSD price per GB is still high compared to HDD. Most of us are still not be able to afford SSD for the whole system, boot and storage. Furthermore, it's possible for SSD to lose its integrity if it's not being used for long period of time which defeats the whole purpose of data storing.